Dec 05, 2017 at 09:52 AM | 367 Views | Last edit Dec 05, 2017 at 09:56 AM 2 rev. I have a problem with conversion on REST Receiver adapter, method GET. 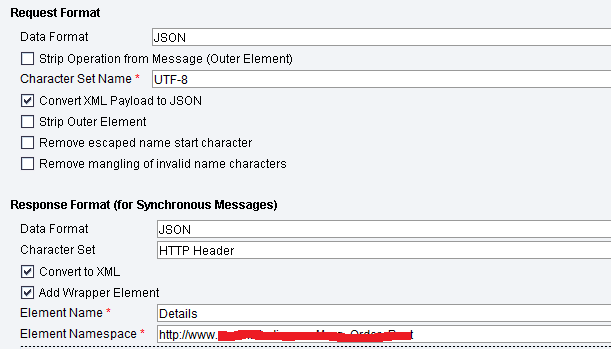 The communication channel is not converting the json payload to html. Getting error in PI. The interface is sycronous: SAP S4Hana (Proxy) -> SAP PO (REST) -> External System (GET method). Here is the json returned from external system. Here is the error message from PO system. Please suggest me to resolve this error. Can you also share your response message type structure, looks like you are adding additional Details wrapper around the response. Thanks for the help. I have resolved the issue by removing add wrapper element option from my communication channel. Can you confirm that the response you posted is the one returned by the external systems? It looks like it has a formating problem. Yes, posted is the one returned by the external systems?. I have already checked for format errors and tried to convert into xml file, did not find any format errors and successfully converted into xml file. Once again I'm uploading the payload. other json to xml conversion tool converts it to xml without any issue. not sure why this is happening. can you try this blog by formatting Ordertails as arraytype.